Multiplication Math Games Creat Smarter, Happier Math Students. Learning multiplication is fun with exciting multiplication math games! Kids and games go hand in. So browse through our growing list of multiplication games and all kinds of other math games on our site. Two players can compete against each other. 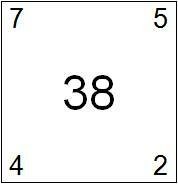 Each card shows four numbers in the corners and one larger number in the center. You must combine the four numbers using two multiplications and either addition or subtraction to equal the larger number. 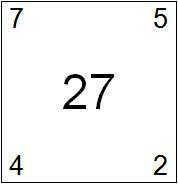 In this case, 7 x 5 – 4 x 2 = 35 – 8 = 27. If the answer is correct, you keep the card. If the answer is wrong, your opponent gets five seconds to state the correct answer, keeping the card if their answer is correct. If no one answers correctly, put the card back in the pile. You can play for a certain amount of time (whoever has the most cards wins), you can play up to a certain total (21 cards, for example), or you can play until the entire deck of cards has been won. 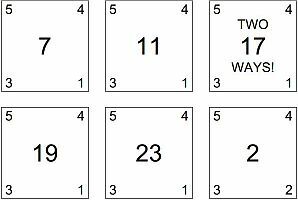 Six of the cards include the note “TWO WAYS!” This means that there are two possible correct answers. You may choose to use these cards in a few different ways. Option 1: To win one of these cards, you need to give ONE of the possible answers. There are no extra points to be earned. Option 3: To win one of these cards, you need to give BOTH of the possible answers. It can be tricky to keep both answers straight in your head, so winning one of these cards is worth THREE points total (the card plus two bonus points). If you play with bonus points, you may want paper & pencil to keep track of them. Here's a couple more multiplication math games that can be played using everyday items. Egg Carton Multiplication Facts game:You and your child can make this homemade game really quickly with an egg carton and cardboard. Multiplication War: Most kids are familiar with the card game of "WAR". Here's a cool game based on "WAR" that helps them practice multiplication. Rolling With The Facts: Print off the game cards and let the fun begin. Why Use Multiplication Math Games? After years of teaching math, I'm not surprised when I see middle school and high school students still counting on their fingers to add and multiply. There's probably no magic bullet to get the multiplication tables into a child's head, but making it fun really helps to keep their interest in learning. Knowing their multiplication tables well, leads students on to multiplying larger numbers well, helping boost confidence, therefore leading to more successful math students. Because multiplication math games are fun, they are a great tool that teachers and parents can use along with traditional mthods for learning multiplication. Homework just doesn't seem to engage students as much as an interactive math game. Start by having your child practice multiplication by playing a game for 5-10 minutes a day. More often students will be willing to play for a lot longer than 10 minutes because it is fun and interactive. For even more multiplication math games, go to the main multiplication games page by clicking the link below.